Join fellow film festival organizers throughout the year for these affordable capacity building, networking and programming opportunities, and an immersive way to experience the flavor and diversity of festivals across the country. 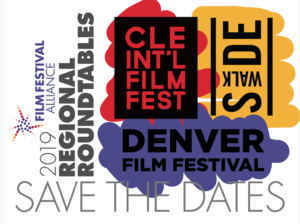 In 2018, Regional Roundtables were held at the Seattle International Film Festival (WA), Woods Hole Film Festival (MA) and Cucalorus Film Festival (NC.) More details coming soon! FFA is seeking new Board Members to begin service in January 2019. Interested FFA members should fill out this brief form. The deadline for nominations is December 24. A slate of candidates will be presented to the membership for voting in January, and they will be announced at the Annual Meeting. The current Board of Directors has set goals of inclusivity that guide our long term leadership development, and encourages all interested parties to apply. Advanced Registration Extended for AHC! AHC is the largest gathering of art house cinema and film festival professionals in North America and is a must-attend event for anyone working in the independent cinema exhibition industry. Learn more about lodging and confirmed panels here.